This collection from SVA by Sonam and Paras Modi really caught my eye when I saw the bold geometric prints strut down the runway at the recent Lakme Fashion Week Winter/Festive fashion show. Whilst the Lakme Fashion Weeks pieces come with a price tag which runs into thousands of pounds, the outfits I'm blogging about today are actually much more affordable, but they still have that wow factor! If I had to choose one of these three for myself, I'd pick the dress on the left, firstly because of the very practical reason that I'm more comfortable with a round neckline and secondly because there's the tiniest hint of green around the bottom which I would use as the basis for my accessories and make-up! The dress on the left and in the centre are both priced at £390 and the dress on the right is £330. I know that's not super-cheap, but considering it's a named designer collection, compared to the prices that most shops in the UK charge for their non-designer/copied outfits, I think the pricing of these is very reasonable. Pricing-wise, the green-bordered sari at £330, the middle sari at £350 and the sari on the right at is considerably more at £585 - probably because the blouse is a lot more intricate! I'm really getting into this kind of chic understated lengha look! I think after seeing so many long, flowing, voluminous, quadruple-layered outfits, ensembles like this are such a refreshing change. I think the key to making this look work is in the fit of the top. 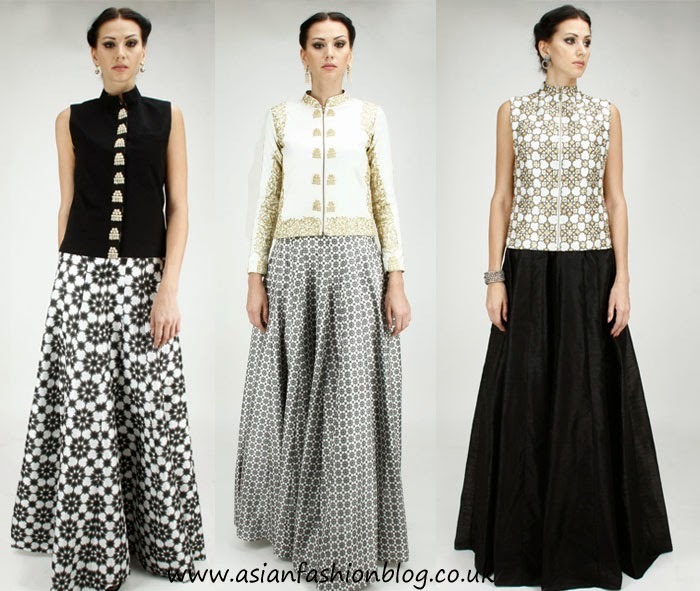 I've only managed to get the prices for these as separates: the black top on the left is £165, the white jacket in the middle is £600 and the white patterned top on the right is £340. 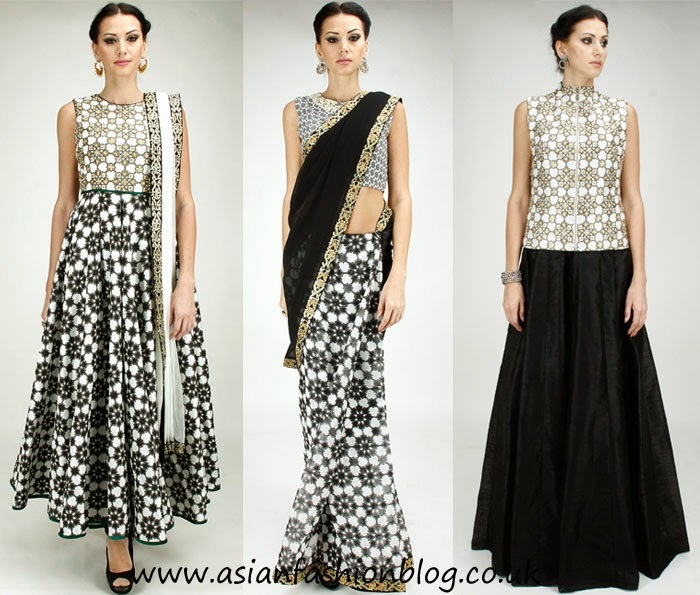 In terms of the lenghas, I'm not sure about the other two, but the one on the right, paired with a long straight kurta top is £265. All of the prices above are from Pernias Pop Up Shop as of September 2014 - if you're tempted to buy you can check out details here. I was amazed today to find these tunics from SVA over on Exclusively.in for under £150! The pricing on the website is in dollars, and they come in at $136 dollars for the middle tunic and $109 each for the other two. I think if I'd seen these on their own, without having admired the rest of the much more expensive collection, I probably wouldn't have paid too much attention to them, however I think it's great to see designers like this having a real variety in terms of price points. I have a $30 credit for this site and I'm seriously tempted to use it on one of these! What do you think of this collection? Is it something you would wear?